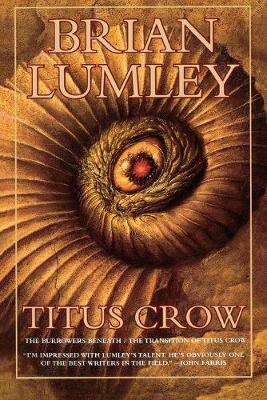 "Titus Crow" presents the first two novels in a striking horror-adventure tale inspired by the works of H. P. Lovecraft. Written in a classic style, The Burrowers Beneath and The Transition of Titus Crow chronicle the beginning of the adventures of Titus Crow. Crow battles the Elder Gods and their offspring wherever and whenever they rise to threaten mankind - on Earth, on other worlds, even on other planes of existence! The greatest of the Elder Gods, Cthulhu, and his dark minions are bent on ruling the earth - or destroying it. A few puny humans cannot possibly stand against these otherworldly evil gods, yet time after time, Titus Crow and his loyal followers defeat the monsters and drive them back into the dark from whence they came. Titus Crow presents the first two novels in a striking horror-adventure tale inspired by the works of H. P. Lovecraft. Written in a classic style, The Burrowers Beneath and The Transition of Titus Crow chronicle the beginning of the adventures of Titus Crow. Crow battles the Elder Gods and their offspring wherever and whenever they rise to threaten mankind - on Earth, on other worlds, even on other planes of existence! The greatest of the Elder Gods, Cthulhu, and his dark minions are bent on ruling the earth - or destroying it. A few puny humans cannot possibly stand against these otherworldly evil gods, yet time after time, Titus Crow and his loyal followers defeat the monsters and drive them back into the dark from whence they came. "Titus Crow and his Watsonian sidekick, Henri Laurent de Marigny, face one danger after another with a mix of horrified fascination and grim determination. Lumley's settings are worthy of H.G. Wells as well as H.P. Lovecraft." --Publishers Weekly It's nearly impossible to stop reading . . . . Lumley presents a modern horror saga based on the Lovecraft mythos. Readers will remain immersed--and surprised--throughout. Highly recommended indeed. "The Bookwatch"
Those who enjoy being scared out of their wits will find plenty to like here. Lumley weaves horror, mystery, occultism, science fiction, and mythology into a wonderfully fascinating story. A wonderful reading experience. "Rapport"
A worthwhile read indeed....the kind of imaginative writing that gives readers the unique sensation of feeling their minds open with the power of the writer's vision. "Fangoria"
Titus Crow and his Watsonian sidekick, Henri Laurent de Marigny, face one danger after another with a mix of horrified fascination and grim determination. Lumley's settings are worthy of H.G. Wells as well as H.P. Lovecraft. "Publishers Weekly"" "It's nearly impossible to stop reading . . . . Lumley presents a modern horror saga based on the Lovecraft mythos. Readers will remain immersed--and surprised--throughout. Highly recommended indeed." --T"he Bookwatch"
"Those who enjoy being scared out of their wits will find plenty to like here. Lumley weaves horror, mystery, occultism, science fiction, and mythology into a wonderfully fascinating story. A wonderful reading experience. "-"Rapport"
"A worthwhile read indeed....the kind of imaginative writing that gives readers the unique sensation of feeling their minds open with the power of the writer's vision." --"Fangoria"
Brian Lumley is the author of the bestselling Necroscope series of vampire novels. The first Necroscope, Harry Keogh, also appears in a collection of Lumley's short fiction, Harry Keogh and Other Weird Heroes, along Titus Crow and Henri Laurent de Marigny, from Titus Crow, Volumes One, Two, and Three, and David Hero and Eldin the Wanderer, from the Dreamlands series. An acknowledged master of Lovecraft-style horror, Brian Lumley has won the British Fantasy Award and been named a Grand Master of Horror. His works have been published in more than a dozen countries and have inspired comic books, role-playing games, and sculpture, and been adapted for television. When not writing, Lumley can often be found spear-fishing in the Greek islands, gambling in Las Vegas, or attending a convention somewhere in the US. Lumley and his wife live in England.